First Coast Crime Stoppers has made it even easier for you to report a crime, Text Tipping. This makes it possible for anyone with a cell phone to immediately report a crime. All you have to do is text "TIP326 plus your message" to CRIMES. 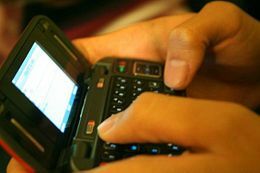 When you text your message to CRIMES the text message is sent from your carrier to an encripter that is located in Canada which assigns you a code number that is immediately sent back to your phone. This code is how Crime Stoppers will communicate with you and if your tip results in an arrest information will be sent directly to your phone on how to pick up your REWARD. Tipping has never been easier or more confidential. Now you can submit a tip to Crime Stoppers any time. This method of reporting crimes should not be used for in progress crimes. For in progress crimes you should always call 911. • Traveling to and from school There is no "right" age for kids to start walking or biking to school alone or with a friend. Each family needs to consider the maturity of their child, how many busy streets have to be crossed, if these streets have lights or crossing guards. o Keep All Doors Shut: Instead of telling kids not to let a stranger in, the real rule needs to be: “Keep the doors shut and locked at all times.” Instead of filling your child's head with "don'ts"; simply tell them to keep all the doors to the outside (including the garage) closed and locked. If someone comes to the door, your child can communicate with this person through the door. o Have a Check-In Time: Another thing parents should ask their child to do is call and let Mom or Dad know that the he has arrived home safely. Set a consistent time for the child to call you each day. Give him/her 10 minutes (plus or minus to allow for a slow bus) or any other event that might occur and disrupt the schedule. You can start to worry if he/she doesn't meet this deadline. Find a close neighbor who is usually home around this time. If the parent can't be reached, make sure the child knows to call this person to check in. Grandparents can provide an excellent “assist” to parents, and if living in town, might welcome a call from a grandchild to say he/she is home from school. o Have a Plan: Parents need to remember that kids who are home alone are much more likely to encounter dangers such as fire from burning popcorn or falling down the stairs than being abducted by a stranger. It is very important that the family has a plan and knows how to react to different situations that may occur. Run practice drills and make sure your child does not hesitate or deviate from the plan that you have enacted. o Rules for Internet Use: Children need to know what is OK to do untilmom or dad get home, and what is not. Getting started on homework, letting the dog out, having a snack, what friends can come over, what websites they can visit and which are off limits. These are decisions and rules that a parent or guardian should discuss with the child and decide on, before school begins. There can be structure to a child’s afternoon, even if no one else is home, leaving less opportunity for an unsupervised child to get into trouble. 3. Attending an event open to the public and supervised by adults and beginning no later than 10:00 p.m.
5. Running an emergency errand.